Tyson Gay won the 100-meter race at the U.S. Track and Field championships, while Justin Gatlin watched, waiting for the next chapter in his own sordid tale. EUGENE, Ore. – A men’s 100-meter race was run Friday evening in the blistering heat of an early summer night at Hayward Field, a race to decide the national champion and two others to represent the United States at the world championships in Beijing late in August, a springboard to the 2016 Olympic Games that lie beyond. It was a good race, a nice race, a solid race. U.S. record-holder Tyson Gay, 32, won in 9.88 seconds, his fastest time since 2012 and his best since serving a one-year steroid suspension from July of 2013 to July of 2014. Once the world’s dominant sprinter, Gay earned his first national championship since the 2008 Olympic Trials (he won both the 100 and 200 in 2013, but both were vacated by his drug positive). “Been a while, man,” he said afterward. Behind Gay was two-time NCAA champion Trayvon Bromell, who is just 19 years old and became the first teenager to make a U.S. worlds team in the men’s 100 meters (though he will turn 20 before the championships are contested). The present and future of U.S. sprinting would seem to be in good hands, as they usually have been. Sprinters come along. But the men’s 100 meters in this moment, is very much the province of two men. One them is Usain Bolt, whom you know. He is the two-time Olympic 100-meter champion, world-record holder andas I have written too many times in struggling to describe Bolt’s endless and deserving crossover appeal–a smiling, dancing, speedy cartoon superhero. The other is Justin Gatlin, a 33-year-old American who did not run have to run the 100 meters Friday night because he owns a so-called wild card exemption for the worlds based on his dominance of the professional circuit a year ago. He will run the 200-meter final on Sunday and expects to also race that event in Beijing. The Gatlin narrative is as complex as Bolt’s is simple. But start with this: If Bolt and Gatlin were to race 100 meters this afternoon, anywhere: Eugene, Kingston, Beijing, Mars…Gatlin would win decisively. Go bet your firstborn on this. Because right now Bolt is a clunky, long-limbed 28-year-old trying to sort out various kinks and foibles (after his 200-meter victory three weeks ago in New York, respected NBC analyst and multiple Olympic medalist Ato Boldon said, on air, “I’ve never seen [Bolt] look this bad in June”). Bolt has rebuilt himself numerous times before, yet it will become increasingly difficult as time passes. Bolt knows this. It’s fun to watch him emerge reborn in August after diet, training and, occasionally, visits to German doctors, and then do his post-races poses and keep the world safe from glowering sprinters. Just assume he will run nine-six again (but not his 2009 world record of 9.58, not ever again). Until he doesn’t anymore. And stay tuned over the next two months. Gatlin is another story altogether, and it’s a story unlike any in the modern history of sprinting. In 11 years, Gatlin has gone from nice guy to villain; from clean to dirty to clean to… dirty again? From young to old, from slender to thick to slender again, from trusted to doubted to convicted to forgiven to doubted again. From cooperative to combative. From needy to needless. He has been running so long that he once raced his current coach, 49-year-old Dennis Mitchell. “I think of myself as a time-jumper,” says Gatlin. On May 15 in Doha, Qatar, Gatlin ran 100 meters in 9.74 seconds. It is the fastest time in the world in 2015 and equals the 10th-fastest time in history. Only four men – Bolt and fellow Jamaicans Yohan Blake (9.69) and Asafa Powell (9.72) and Gay (9.69) have run faster. No man has run faster older (Linford Christie of Great Britain was 33 when he ran 9.87 in 1993 and later was busted for steroids; Bruny Surin of Canada was 32 when he ran 9.84 in 1999). The time is faster than Gatlin ran nine years ago, also in Doha, when he equaled Powell’s world record of 9.77 seconds shortly before receiving a four-year suspension for steroid use. And there is that, too: No man has come back from the death penalty of a four-year suspension and done anything approaching Gatlin’s performances. A (sort of) brief history of Gatlin: He won the Olympic gold medal in the 100 meters in 2004, upsetting the favored Powell (who suffered the first of his many big-race meltdowns and finished fifth). At the time, Gatlin’s coach was the notorious Trevor Graham, who also had coached Marion Jones. On the night of the Olympic 100 meters, in the back of a press conference room, Graham admitted to sending the tainted syringe to the U.S. Anti-Doping Agency, a huge part of the BALCO investigation. This occurred minutes after Gatlin’s gold medal. Such was the atmosphere. The Gatlin who won that gold medal was a sweet, friendly young man. “I was the good guy, right?” Gatlin says now, as if in amazement. Many inside the sport saw bad things coming at Graham and encouraged Gatlin to distance himself from his coach. Gatlin did not, and in 2006 he tested positive for “testosterone or its precursors.” (Graham, meanwhile, was drummed out of the sport, banned for life in 2008 leaving behind a lengthy list of busted sprinters). Graham and Gatlin argued that Gatlin had been sabotaged by a massage therapist with a grudge against Graham, and who then rubbed testosterone cream onto Gatlin at the 2006 Kansas Relays, triggering a positive test. Gatlin, nonetheless, admitted to the drug in his body and was given a four-year ban (he was eligible to receive an eight-year ban, but argued that an earlier positive test for an ADD medication should not count, and arbitrators agreed; more on this below). He tried playing football, increased his weight from 183 pounds to 210 pounds, appealed his suspension in 2008 and, in the end, served his entire sentence. This seemed like a tidy end to the story. Maybe Gatlin was sabotaged or maybe he was sabotaged by his own coach, because who knows what Graham might have been doing? Maybe he was telling the truth or maybe he was lying. But he did four years in the prime of his career and lost millions in earnings while spending hundreds of thousands on legal fees. It was a far more rugged punishment than we see levied against athletes in most sports. “It’s rare for a 100m sprinter to improve beyond 30. Bolt’s current PB was at 22, as was Yohan Blake’s. Asafa Powell and Nesta Carter were 25, Tyson Gay was 27. In Gatlin’s case, with all the age talk, there is also a mitigating factor. Gatlin did no sprint racing, and almost no sprint training for four years. His agent, former hurdler Renaldo Nehemiah, has pointed out that while Gatlin’s birth certificate says he is 33 years old, his athletic age is much less than that. There’s minimal science on this, but it passes some sort of common sense test. Then there is a recent study at the University of Oslo suggesting that the benefits of anabolic steroids last long after usage is discontinued. 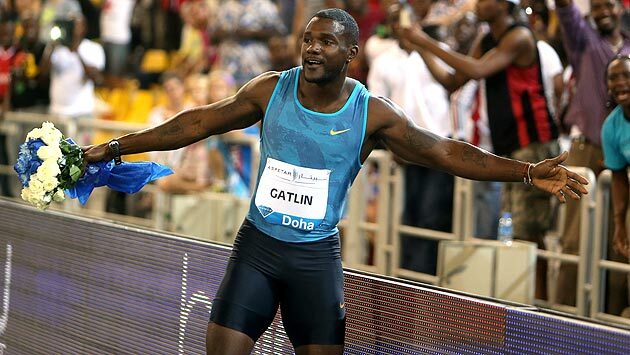 It is on this point that Gatlin has been repeatedly challenged in recent months and found himself in several testy exchanges with media, uncharacteristic of the “nice guy” who won the gold medal in 2004. At a press conference here in Eugene, he refused to answer questions from both Weldon Johnson of the website letsrun.com and veteran journalist Scott Reid of the Orange County Register, both of whom were attempting to ask about Gatlin’s doping history, which he had never discussed extensively in a media setting. Shortly after that press conference, in an interview with SI.com, Gatlin provided some answers and displayed some frustration. As to the issue of steroids still benefiting him today, he said, “I was never a steroid user at all, at least not knowingly. There was one incident.” Here I asked Gatlin if he was referring to the massage therapist sabotage and he said, “Yes, a situation that was not my fault. “ He chose not elaborate further. Then this “I was never involved in what people call long-term steroid use. “Why are people taking shots at me now?” Gatlin asked. “Why didn’t they come after me in 2010? And if I was still getting some benefit from steroids that I supposedly took, why didn’t I run 9.7 back in 2010 and 2011. I’m getting more benefit from them now? I mean, wouldn’t it have worn off more by now?” Pause here: Gatlin is 25 pounds lighter than in 2010. That’s a factor. Okay, continue: “Look at other guys who have been in my situation,” says Gatlin. “None of them have come back close to what I’ve done.” Gatlin won’t say names, but here are some: Dwain Chambers, Tim Montgomery, Gay, Powell. None of them have come back from suspensions–equal to or shorter than Gatlin’s–and run personal bests. (Although Gay and Powell are running well currently). Of course, because this is sprinting, it’s easy to take Gatlin’s fast times as evidence that he is using steroids anew. (And to take it one step further, his coach, Dennis Mitchell, was once busted for steroids). It would be foolish to dismiss the possibility. Gatlin sees this as a cycle that just goes on endlessly, and himself as the prisoner who’s set free only to find a parole officer at his door every day, waiting for him slip up. “There’s no end to this,” he says. “I served my time. I did my punishment. I sat out four years and here I am, still getting punished for something that happened to me, literally, a decade ago.” Had Gatlin kept running 10-points, none of this would be an issue. He also would not have signed a two-year endorsement deal with Nike in the spring. For three years Gatlin was repped by Xtep gear; they gave him prototype shoes for the London Olympics and he had to Super Glue them together for the final of the 100 meters. Gatlin is often described in media as a two-time loser in the doping game, a reference to a positive test in 2002 for amphetamines, because he had been taking Adderall for 10 years to treat attention deficit disorder. “That makes me a two-time doper?” asks Gatlin. “I don’t understand that at all.” The characterization is unfair, but it’s not going away. My stance on all of this has not changed in total. I don’t know if Justin Gatlin is running clean, just like I don’t know if any athlete in any sport is clean because I don’t know what they do in their bathrooms and I don’t trust the drug-testing infrastructure enough to have faith. Gatlin is running suspiciously fast for a 33-year-old man, but there are significant mitigating circumstances that could explain this. He was brilliantly talented as a young sprinter, twice taking 100 and 200 meters at the NCAA championships and running 9.77 at age 24. Had he not been busted, he probably would have run faster. (Or: if you like, had he not be doping, he never would run that fast in the first place). The doping game is always murky. I know that Gatlin served a crushing penalty for his crimes and was set free. That has to mean something. He helped authorities, like Tyson Gay did, although it was the IRS that Gatlin assisted (not USADA) and his work did not get his sentence reduced. You can love him or hate him for that. But Gatlin took his beating and came back. He did his time. Beyond that, skepticism is healthy, but outrage is not. This is sprinting, after all. Know this: Today, right now, the Gatlin Story is playing out in the backwater of track and field media. A year from now, if Gatlin is still running fast and the Great, Unbeatable Usain Bolt is still spending too much time doing things other than training hard and still running slowly by his standards, and if the world watches Gatlin take down the Man Himself on worldwide television in Rio, there will be bloody outrage. This does not end soon for Gatlin.